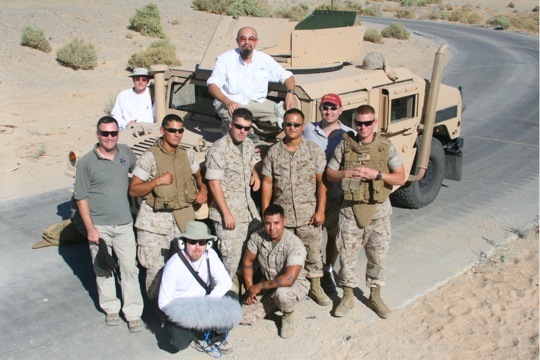 Aaron Marks Special: Recording Sounds for "Operation Flashpoint: Dragon Rising"
Hard chargin’ Marines from the 3rd Light Armored Reconnaissance Battalion and On Your Mark Music Productions crew on location at the Marine Corps Air Ground Combat Center (MCAGCC) in 29 Palms, CA. 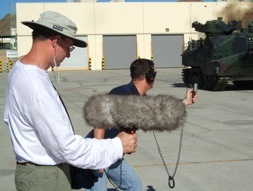 Originally called because of his connections to both the game audio world and the Marine Corps, Aaron began the almost 8 month process of finding vehicles to record, obtaining permission and support from the Department of Defense, The Pentagon and the Marine Corps then gathering his team, making a plan and organizing the trip. With the support of key teammates Watson Wu and Kevin Collins, they were able to work through the logistical needs and develop a strategy that would allow them to hit the ground running, working fast and efficiently while ensuring access to everything on the cue sheet. Once the ‘official’ government approval was obtained, it became a simple matter of coordinating directly with the Public Affairs Office at 29 Palms to develop a schedule that would give the best chance to have the requested vehicles available. Because 29 Palms is typically the last stop for outbound combat units, extra options and backup plans had to be available so the time on deck could be optimized. Packing light, with the focus on mobility, being able to squeeze into uncomfortably tight spaces and capturing a variety of perspectives simultaneously, the gear not only had to endure the hot and dusty conditions but also achieve high quality, multi-channel recordings at 96khz, 24 bit resolution. The main rigs included an Edirol R44 and Fostex FR2 with a Zoom H4, 2 Zoom H2’s, 2 M-Audio MicroTracks and a variety of microphones, depending on the needs and conditions. A Neumann 191, Schoeps CMIT 5U, Sennheiser 418, AKG D112, Countryman B3’s and DPA 4061’s provided enough options to grab the right sounds at the right time. With upgraded power packs, batteries, attenuators and memory cards, the technical part of the sessions were surprisingly flawless with the only real hitch being several noisy crows, the occasional streaking fighter jet and other intruding vehicles ruining good takes. The crew found rocks and a bullhorn a good defense for the wildlife but ineffective on the Marines. That’s where retired Marine Major Kevin Collins came in handy. 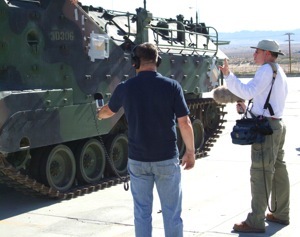 Nathan Smith, Aaron Marks and Watson Wu, mobile and ready to record the M1A1 Abrams Tank on loan from the 1st Tank Battalion at MCAGCC, 29 Palms, CA. 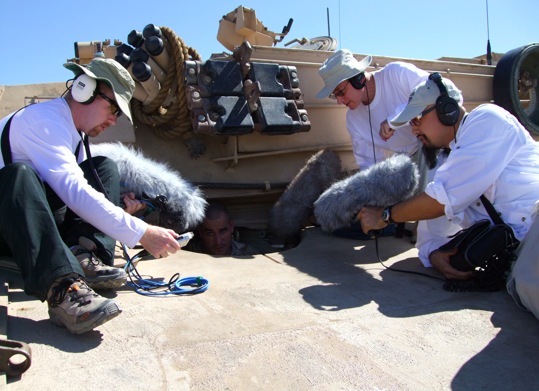 Nathan Smith, Aaron Marks and Watson Wu capturing sounds of the drivers compartment on the M1A1 Abrams tank. With the budget only allowing for 5 days on location, they planned on 1 vehicle per day, with focus on the tank possibly taking a day and a half. The daily process started with finding the quietest place to operate and record each subject. Because most of the almost 1000 square miles of the base is considered a live fire range, the vehicles were directed to the outskirts of the ‘main side’ area, which kept the travel time down and stayed close to the facilities. A briefing was given to the vehicle crew explaining the needs of the game and the plans to capture the unique elements as the walk around of the vehicle was conducted. The crews were eager to point out distinctive sounds their vehicle would make and the needed gear was unpacked. The mornings, because of the almost non-existent wind, were used to record the general Foley sounds, hatches opening and closing, manual turret traversing, guns elevating and other power off operations and gizmo’s. After lunch, the DPA’s and Countryman mics were affixed to strategic external spots to capture engine, exhaust, suspension and track or tire sounds, depending on the type of vehicle, and all cables were run to the ‘commanders’ hatch where Watson Wu manned the ultra-portable, high fidelity, modified R44 recorder and would direct the vehicle. Unfortunately, because of military regulations requiring a helmet and flak vest, it wasn’t always possible to monitor the recordings other than by looking at the meters. “Watson’s experience from various racing game projects and other high speed vehicle recording sessions proved invaluable. Mic placement and his creative method to eliminate wind noise really made all of the difference and we achieved some outstanding recordings”, explains Aaron. The ‘powered’ portion of the afternoon began with start up and shut down procedures, powered turret and gun movements and steady off load rpm’s at idle, 1000, 1500, 2000 and 2500 rpm. Once those were complete, it was off under power across rough tank trails and dunes for suspension noises and smoother surfaces for the needed steady sounds for loop construction. 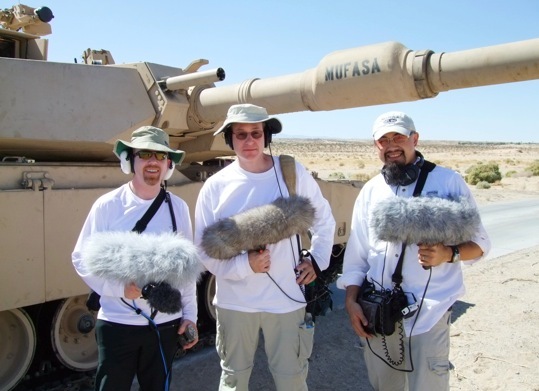 Nathan, Kevin and Aaron captured the internal perspectives either in the troop or gunners compartments which often proved a challenge, blindly bouncing around in the cramped darkness, fighting incredible diesel fumes, heat and nausea while keeping the mics and gain levels steady. “Except for the troop compartment nightmare of the AAV and spinning around inside the M1 turret, I think we all enjoyed the experience”, says former 1st Tank Battalion Executive Officer, turned military consultant and recordist Kevin Collins pointing at Aaron laughing. 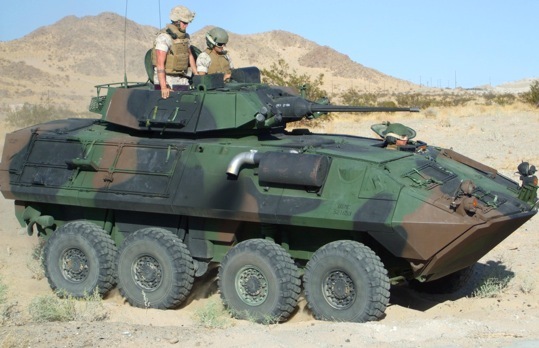 ￼A Light Armored Vehicle (LAV25) from the 3rd Light Armored Reconnaissance Battalion maneuvering during the recording session at 29 Palms, CA. Each night back at the hotel, memory cards were transferred to a laptop and a minimum of 2 external hard drives, saving the days recordings, photos and HD videos. Batteries were recharged, the gear was cleaned and reorganized in between showers and fresh changes of clothes and somewhere in there, stomachs were filled. Each night ended around midnight – 1am and the process started again at 530am the next morning. Once the field recordings were complete and everyone made it safely back to the comforts of their studios at the end of the week, the over 150 GB of recordings were cleaned up, organized and labeled then overnighted to Codemasters on a hard drive for their editing and implementation.